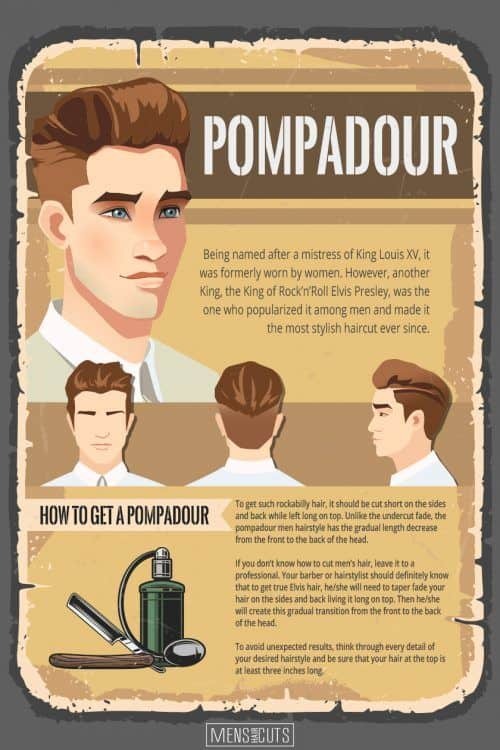 Do you fancy a pompadour hairstyle? It can add a royal touch to your look. With such a haircut, it’s much easier than it seems. Being named after a mistress of King Louis XV, it was formerly worn by women. However, another King, the King of Rock’n’Roll Elvis Presley, was the one who popularized it among men and made it the most stylish haircut ever since. Are you ready to bring out your inner King? 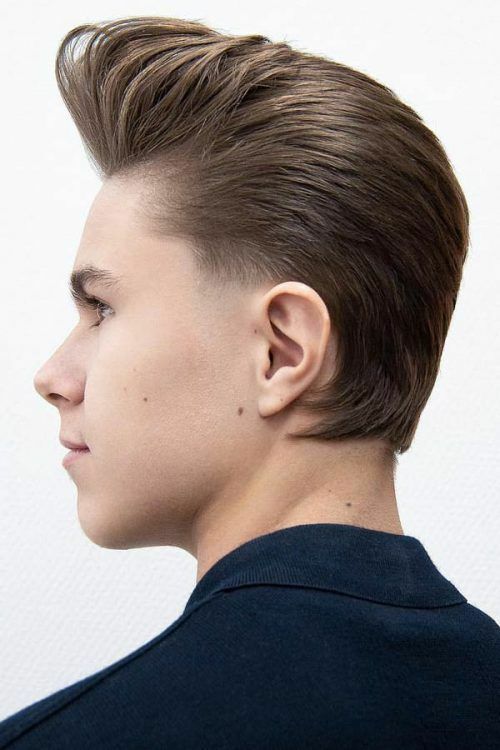 To get such rockabilly hair, it should be cut short on the sides and back while left long on top. 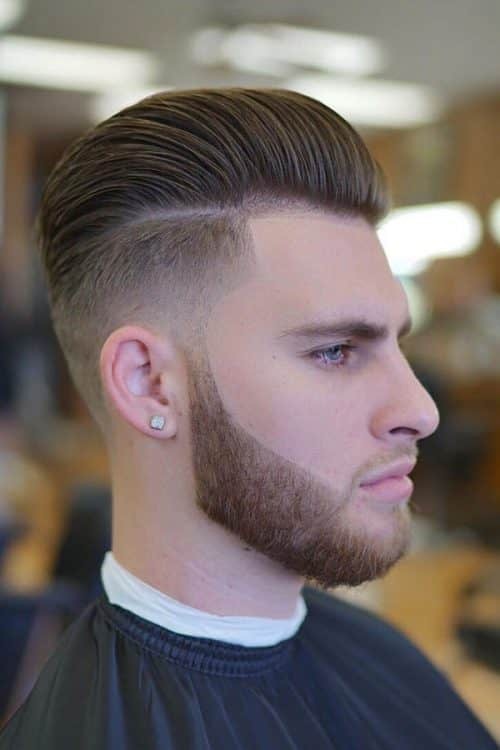 Unlike the undercut fade, the pompadour men hairstyle has the gradual length decrease from the front to the back of the head. This “pomp” effect made it one of the most popular 50s hairstyles. Today’s pompadour has nothing to do with the greasy hair it used to be in the past. Nowadays, it’s much looser and more textured. 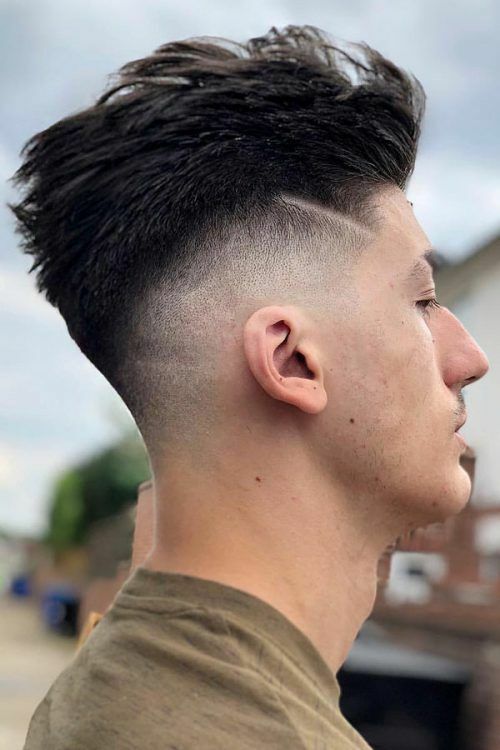 However, if you don’t know how to cut men’s hair, leave it to a professional. 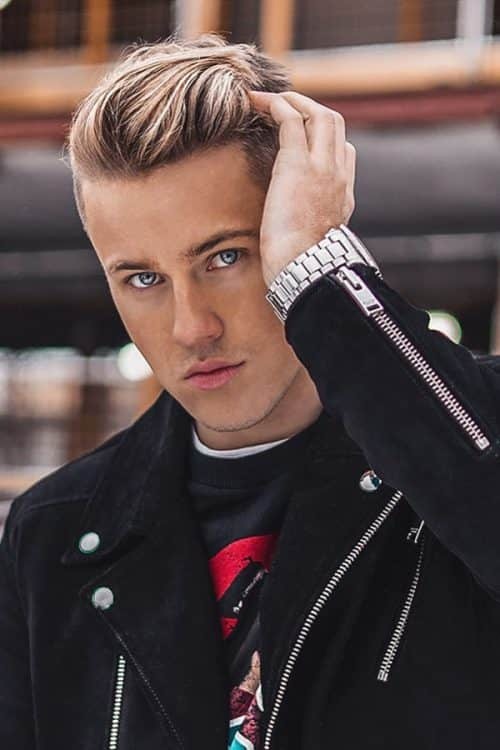 Your barber or hairstylist should definitely know that to get true Elvis hair, he/she will need to taper fade your hair on the sides and back, living it long on top. Then he/she will create this gradual transition from the front to the back of the head. To avoid unexpected results, think through every detail of your desired hairstyle and be sure that your hair at the top is at least three inches long. 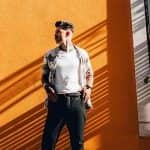 Now that you have the haircut of your dreams, you might wonder how to style a pompadour, as visiting a barbershop or hair salon every day is hardly ever an option. These six easy steps will help you to get the most of your look! Wash your hair and blot it dry with a towel. It will prepare your hair for the future manipulations. Get a bit of wax, putty or pomade, warm it by rubbing between your hands and run your fingers through the hair. Ensure that the hair styling product is evenly distributed all over your pomp. Gently blow drying, comb your top hair up and back. 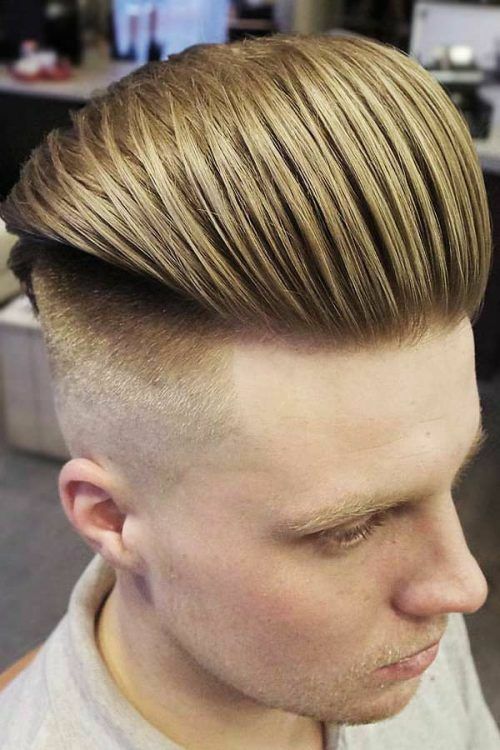 Thus, the pomp will start to curve and you’ll be able to get the volume and form you want. To get the maximum hair volume and styling product hold, brush up the roots with a comb, shaping your pomp the way you like. 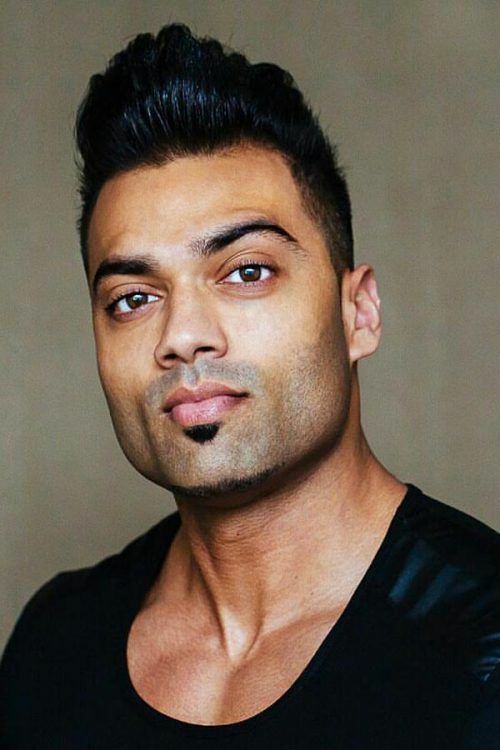 Based on your hair length, you have multiple options on how to shape the pomp. 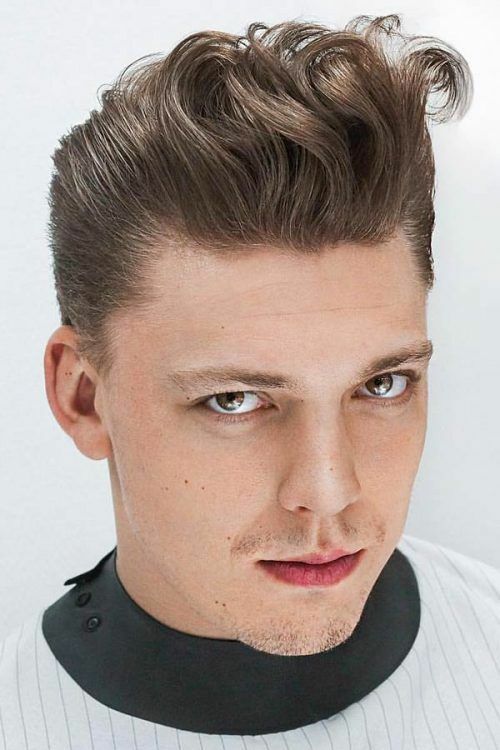 If your pompadour is a long on top short on sides type, you can push the back of it up, while smoothing the front. Or you can pay more attention to the back if your pompadour is short. Another option to consider is a low fade comb over with or without a part. Use a comb to divide your hair for parting and brush it to the side that flatters you best. Finally, fix the outcome with a blow dryer. 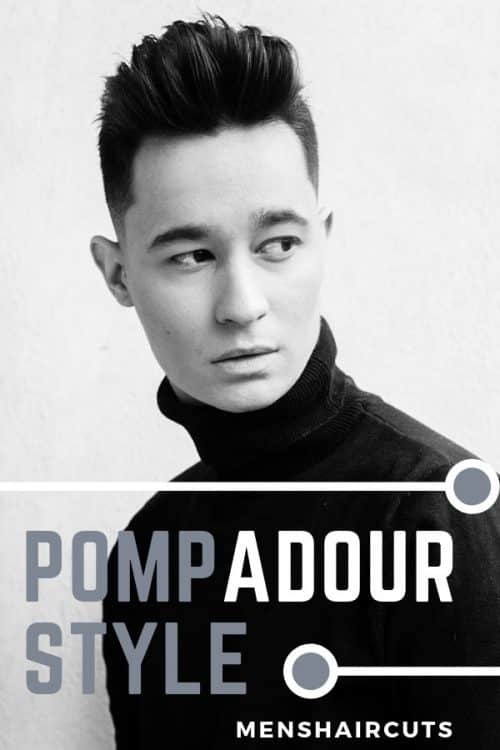 The modern pompadour has many different variations and is totally adaptable to various settings, styles, tastes and hair types. Taking into account all these conditions, choose the most appropriate pompadour haircut for yourself. A classic pompadour, as the name implies, is the most similar to the genuine version. 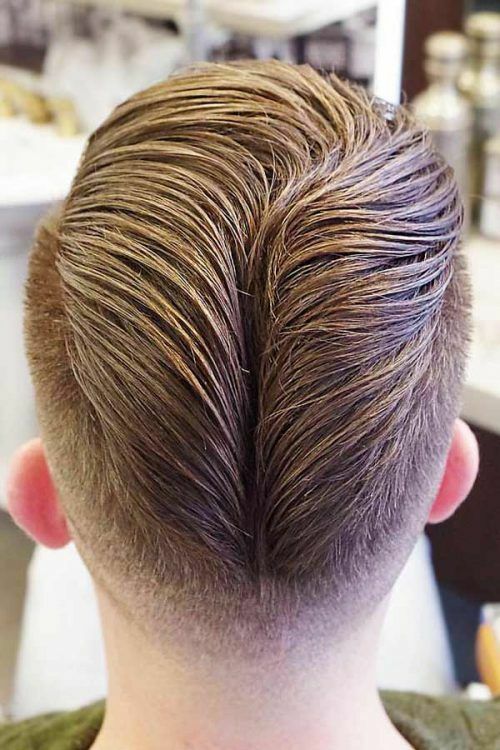 Unlike the ducktail haircut, it does not have a central parting that runs down the back of the head. It’s also not as tapered as the low fade pompadour is. However, its most distinguishing feature is a shiny, polished, sometimes even oily finish that can be achieved with a hint of hair grease. 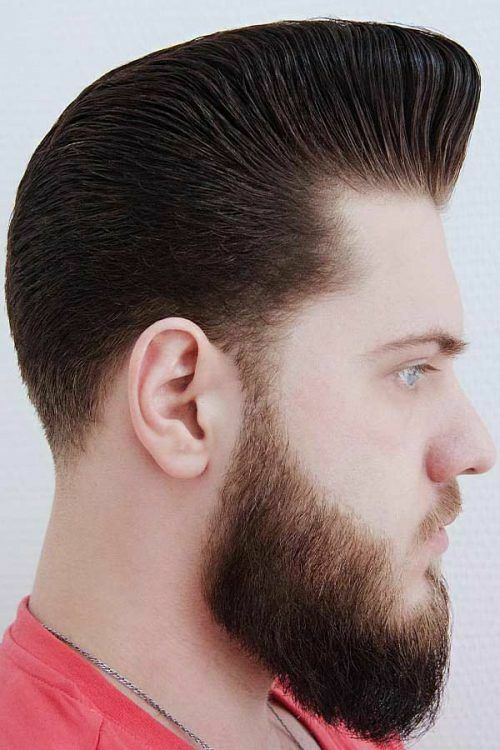 Contrary to the classic version, the modern pompadour is much messier and more outlined, yet very elegant and refined. 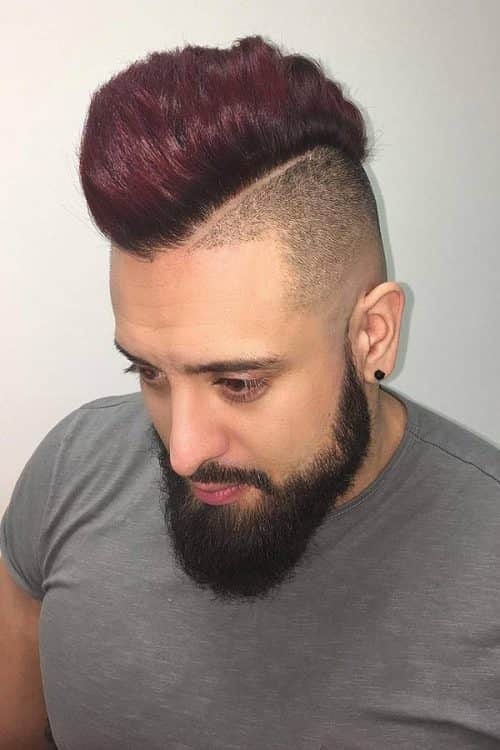 Being a men’s fade haircut, it requires having an exceptionally lengthy and voluminous pomp. This effortless hairstyle look, involving a minimum of hair styling products, pays tribute to the minimalist approach of the present, thus winning the title of one of the best men’s short haircuts 2018. Are you keeping up with the latest grooming trends? Then you’re bound to try this bold take on pompadour hairstyles. The pomp is styled so that it forms trenches at the front section, which looks really eye-catching. 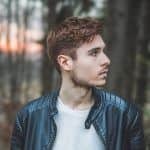 Although you may not need any special tools for this trendy hairstyle, as your fingers will basically do the whole job, you may want to stock up on a hair styling product with a strong hold. 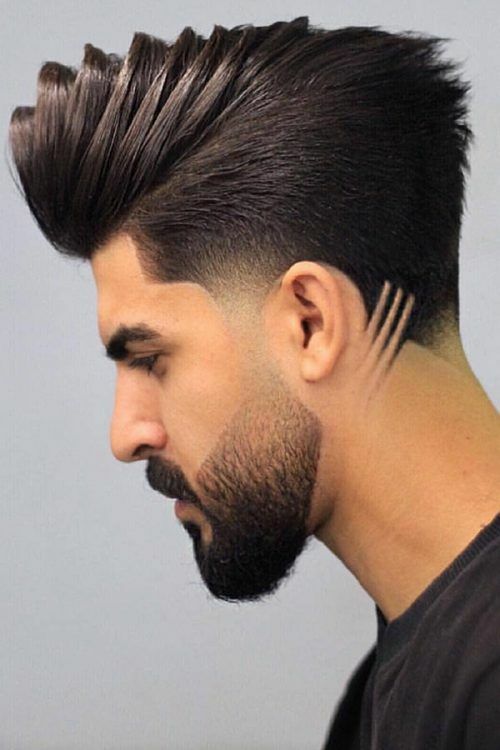 This contrasting and daring haircut, leading the lists of the most popular hairstyles for men, will make you really pop. Due to its buzzed sides, the pomp looks exclusively dramatic. The undercut pompadour will define your edgy and sharp personality in the best way. Are you really into subtle and neat styles although still eager to be on-trend? The short pompadour successfully enlivens the boring commonness of the men’s short hairstyles. However, note that you will need to apply a large amount of hair styling products to set the moderate pomp properly. Accentuate your haircut with a sharp edge – add a parting to your pomp. It will bring some dimension to the tapered hair look and make it really pop. You can style your pomp high or just comb it to the side. If you’ve always wanted to try on the hipster hairstyle, it’s time to give it a shot. 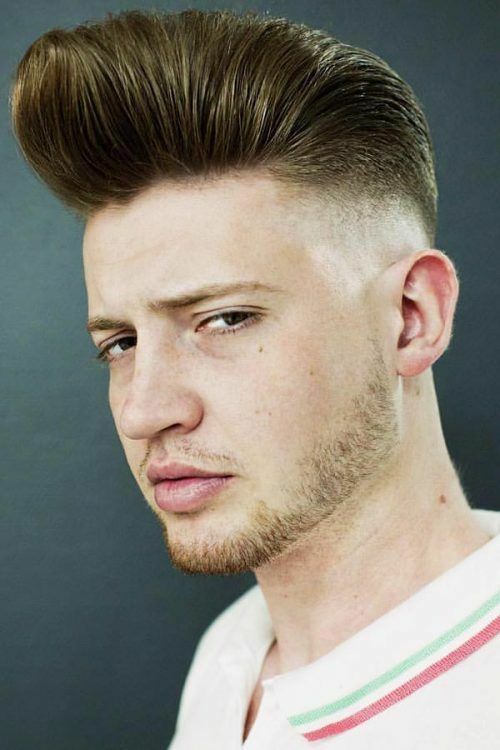 The textured top pompadour looks extremely saucy with short sides long top combination. What’s unique about this hairstyle is that it goes classy with any hair type, whether it’s straight, wavy or curly. To avoid looking scruffy, balance the look with the high skin fade. 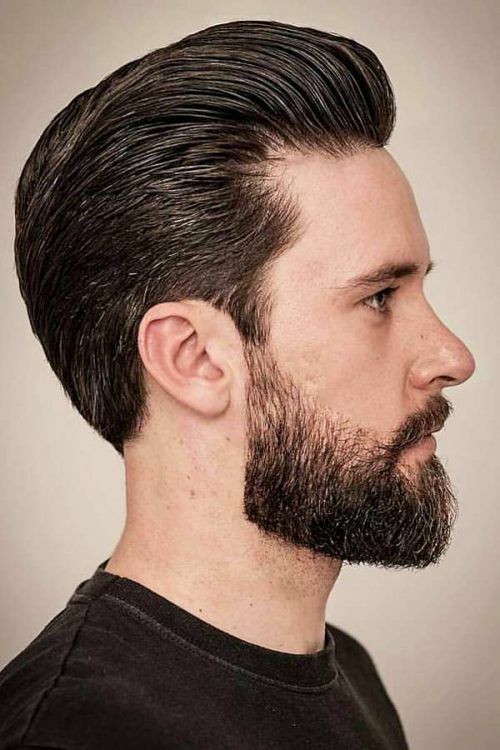 A pompadour fade is an incredibly versatile hairstyle. It gives you a number of fade types to choose from. Depending on the side hair length, you can opt for a high, mid, low or skin fade. Not every man would dare to wear a Mohawk pompadour fade. It requires careful attention to detail and high precision of lines. It can be really challenging to keep the look on top because this pompadour styling requires a lot of dedication and hair products. However, if you do manage to keep it up, it completely pays off. It may seem unbelievable at first, but a pompadour is a very versatile hairstyle. Although with a classic pompadour hair texture is supposed to be straight, there is an option for basically anybody. If naturally you have curly locks, try on a curly pompadour to give your hair an elegant yet stylish touch. Here’s another way to style your pompadore so that it wouldn’t look too preppy. Tousle the hair on top with a sparse amount of hair styling product with a matte finish to add a bit of movement and texture to it. 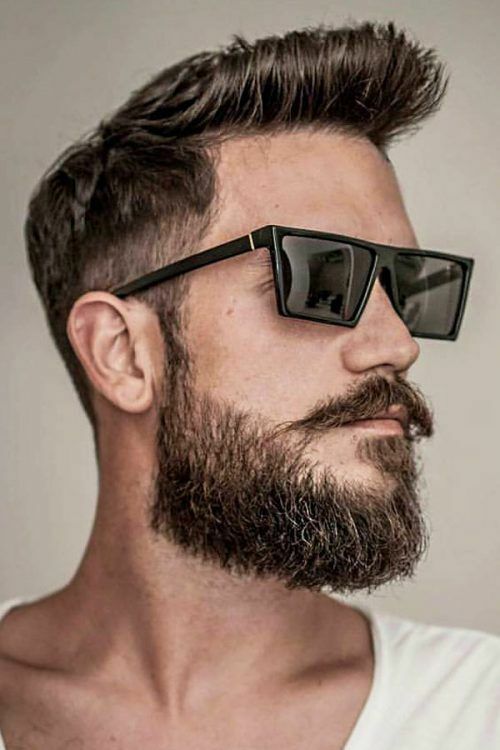 It’s better to flaunt your messy pompadour with a pair of stylish shades and a nicely trimmed beard to complete the look. When it comes to volume of the mens pompadour, only your personal taste is the limit. You can go with the hair atop as ample as you wish, but think carefully what you’re going to balance it with. 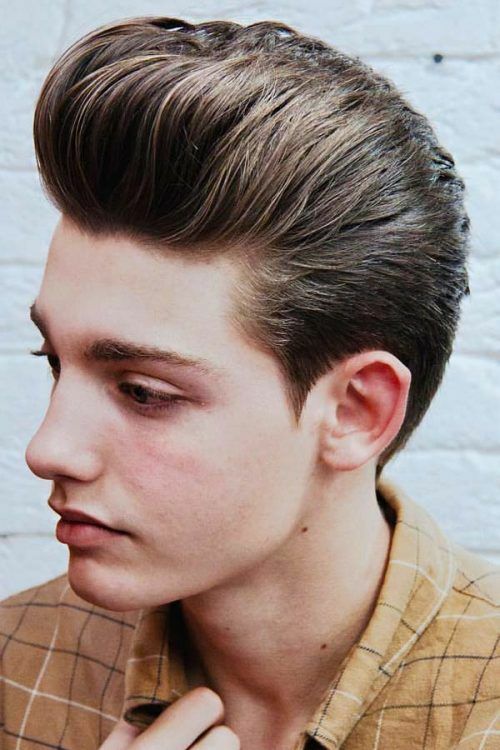 Voluminous pompadours come out flattering with all kinds of fades and tapers. Pompadour haircuts can be as creative as you allow them to be. Adorn your pomp with an undercut and elaborate hair design shaved in on one side. For more contrast and definition, swipe the hair on top to the opposite side. 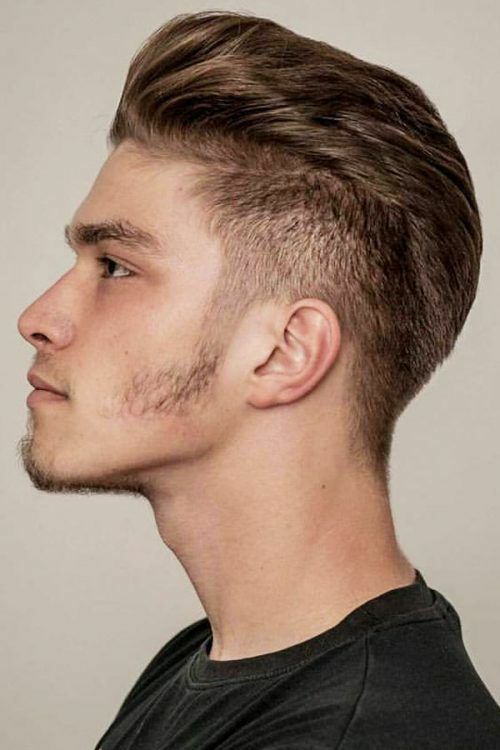 If you’re not much into hair designs nor do you gravitate to long hairstyles, you may still create a contrasty and edgy look with a short pompadour undercut. 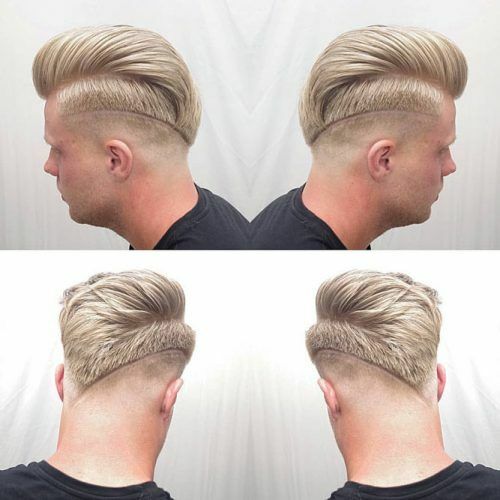 Get the sides faded or tapered for a clean cut and stylish appearance. To transform your hairstyle into a Japanese pompadour, pair it with subtle sideburns and a narrow strip of facial hair on the chin. 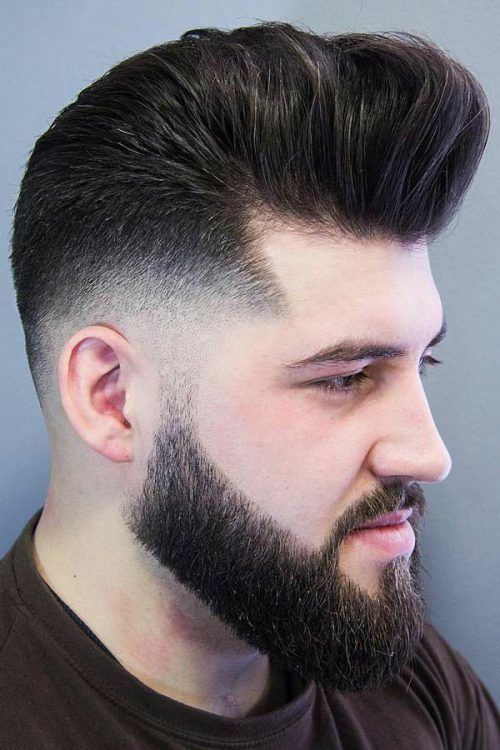 A pompadour is already quite a sharp hairstyle, but you can add even more edginess to it by creating a defined contour with a line-up along the forehead, temples and cheekbones. The high taper fade on the sides and back is a rad addition to the look. What are the best sources to draw your inspiration? Celebrities and trendsetters are a nice option, but they also get it from somewhere. Your surrounding will give you an abundance of original ideas, such as this mountain-like pompadour men with an exquisite sense of style would only dare to rock. 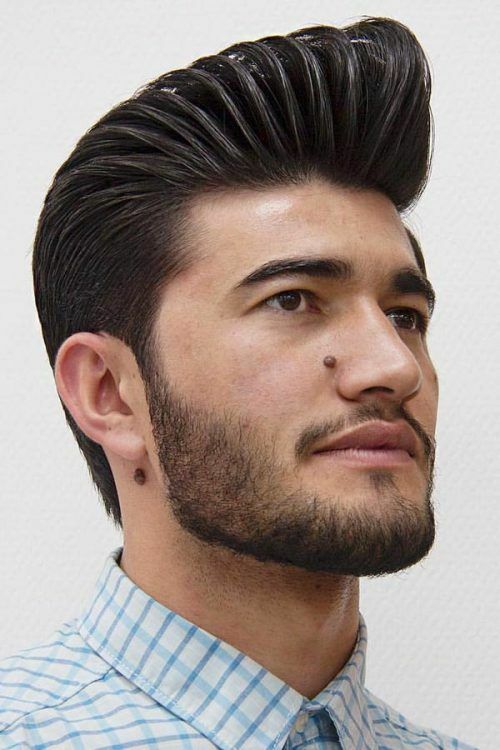 A pompadour can be adjusted to follow the most popular tonsorial fashion trends, such as short on sides long on top hairstyles. To achieve it, get the hair on top disconnected from the sides and lift it up. This distinguished ‘do will sit perfectly on any men no matter his hair type or personal style. You don’t always have to bring changes into a classic pompadour. This timeless hairstyle looks beyond praise when flaunted in its original form. It’s a gold standard of real gents who want to add a touch of retro and a dose of elegance to their look. The pompadour haircut has withstood the pressure of time, fashion and gender, adjusting to the relevant trends and needs of society. It has evolved into a variety of forms, styles and combinations, allowing every man to find the most complimenting hair look for him. However, no matter how drastically the pompadour changes, it never loses its edge. * The Bowl Cut Is Back In Town!